I'm in Beijing for an annual conference, and decided to stay at the Imperial Mansion, Beijing since it is just on the block next to the Grand Hyatt Beijing. Not knowing exactly when I would arrive in the city, I didn't make plans to have dinner with anyone. I figured I'd just pop into DaDong Artistic Conception Food (大董中国意境菜), as the Wangfujing branch of the chain is in the shopping mall right next to my serviced apartment. 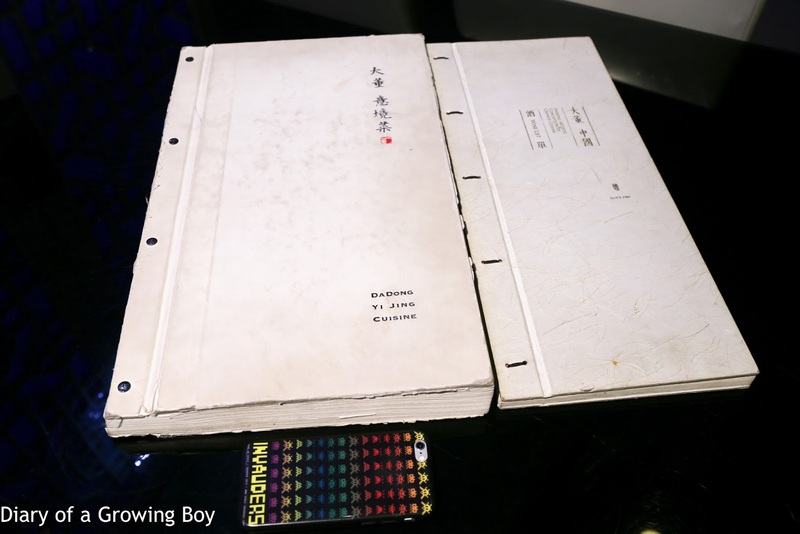 I was handed two large menus once I got seated. Contrary to popular belief, DaDong is not all about Peking duck. 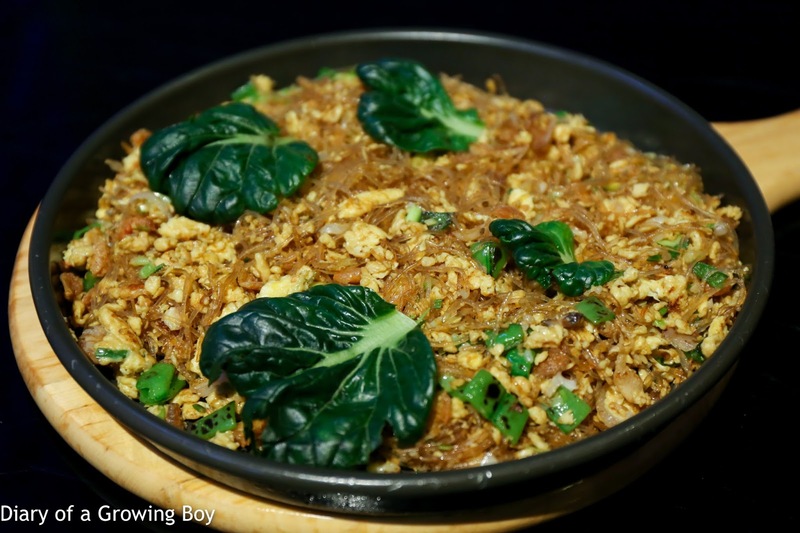 Founder Dong Zhenxiang (董振祥) has created a whole range of modern Chinese dishes, often using non-traditional ingredients and/or cooking methods. The dishes are often presented in an artistic fashion and accompanied by poetic descriptions. What's more, some of the dishes rotate according to the seasons and the availability of ingredients. I've been pretty impressed by my previous visits. In fact, I prefer the creative dishes from the menu over the duck that first put them on the map. So I proceeded to order four dishes - which, admittedly, was waaay too much for one person - and skipped their "superlean" roast duck. 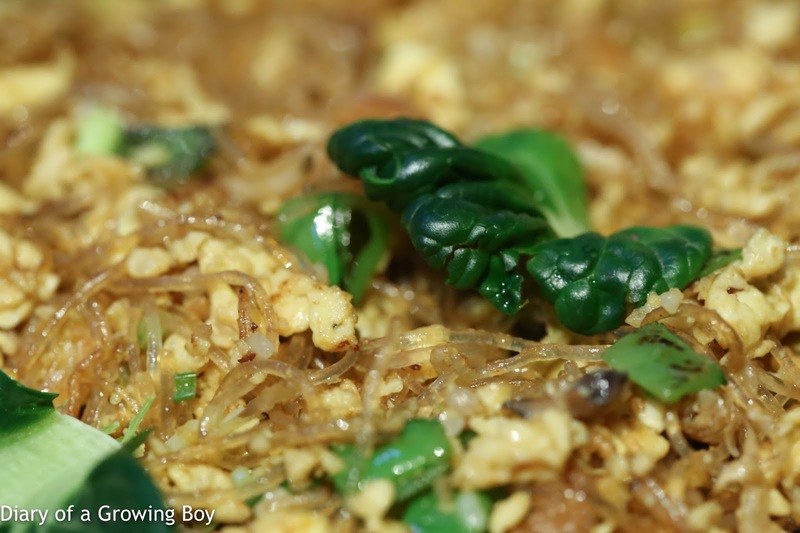 Fried osmanthus rice noodles (炒桂花粉丝) - I let out a helpless laugh when this arrived first. For all the effort Chef Dong put into creating dishes which are both tasty and artistic, and with all the modern touches added, it is unfortunate that his staff failed him at the most basic level. In Chinese cuisine, there is a traditional order of how dishes are to be served. Vegetables and carb dishes such as rice and noodles are meant to be served last. But of course, the staff in the kitchen doesn't care. They just wanna knock out dishes when orders are sent in. And front-of-house staff either haven't been trained about this, or they also don't care about the diner's experience. So... instead of getting this dish last, it came first. Knowing I had three other dishes coming, I took a small bowl of this and asked to pack the rest. The execution was very, very good. It's clear that this was stir-fried at very high heat, and the chunks of dried shrimp were so crunchy that I thought I bit into big chunks of sand - but these turned out to be very tasty. Braised pork intestines in multiple flavors (九转大肠) - I love pig intestines, and these were really, really good. The thick sauce was both sweet and savory, with a spicy kick at the back end, and the finely diced coriander lent the dish a nice fragrance. Served with little domes of hawthorn paste. I love the springy texture, even if the outermost layer was a little tough and almost a little leathery. 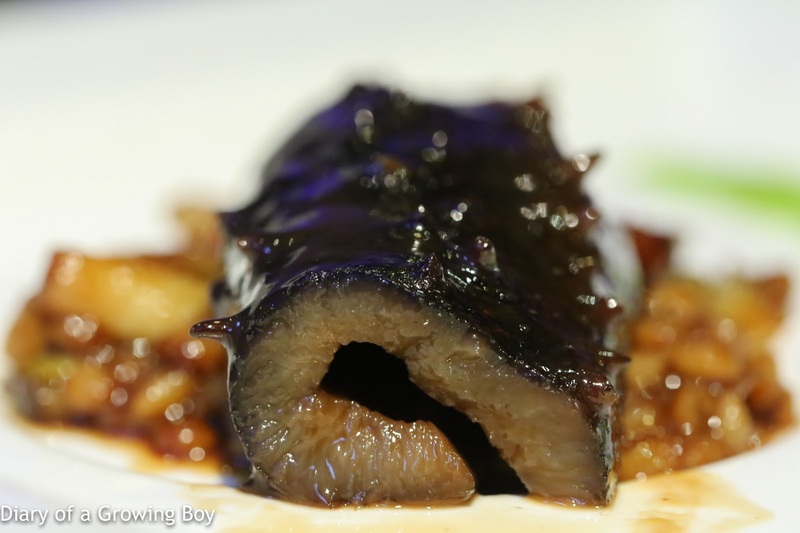 Chef Dong's braised sea cucumber with fresh wheat (董氏新麦烧海参) - I couldn't order the signature sea cucumber dish as the serving is too big, so I settled for this. The spiny sea cucumber was about 80 grams in weight. 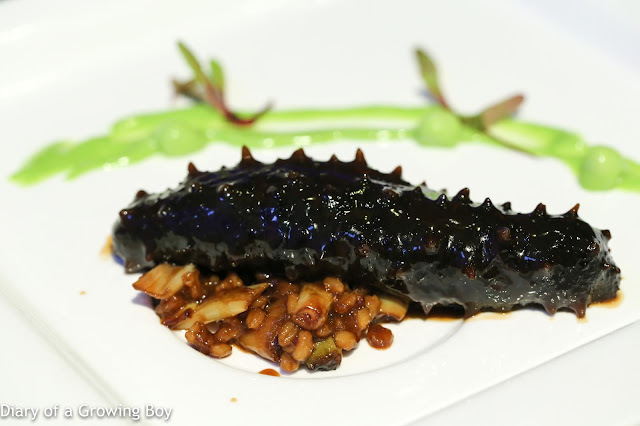 As I had expected, the sea cucumber was very, very tender... and very tasty. The braised leeks were a familiar touch, having absorbed the rich and tasty sauce. 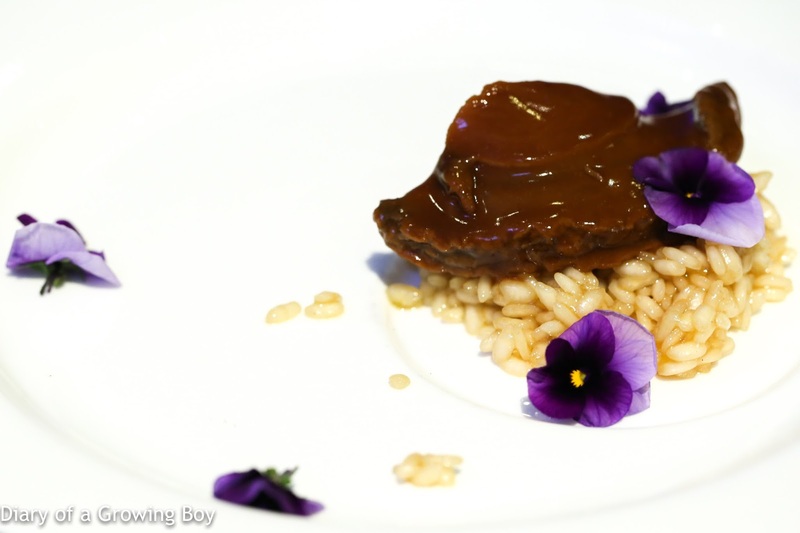 The barley grains were plump and crunchy, having also soaked up the sauce. The cucumber balls and coulis on the side provided a little bit of acidity for balance. Very good. I didn't bother asking about the size of the abalone, but the half I was served certainly proved plenty. It was very, very tender, and the flavors were all there. 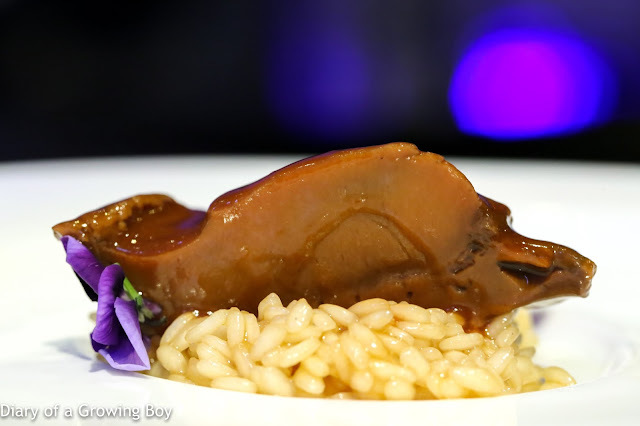 I was very happy to have had this dish, because I had initially been told that they were out of dried abalone and could only serve me fresh ones. Fresh abalone, of course, could never hope to deliver the same rich flavors are dried ones which have been rehydrated and braised. Unfortunately the risotto failed. Yes, I prefer my risotto al dente, but this was undercooked and still raw in the middle. But it did get a nice coating of the rich and sinful abalone sauce. This was a very good dinner, and having ordered two of the premium ingredients of Chinese cuisine, it was also not the cheapest dinner for one. But I'd do it again in a heartbeat, and I look forward to coming back and trying out more dishes from the extensive seasonal menu. DaDong is one of my favorite restaurants in China, even if I don't care for their duck!